Drinks like coffee, tea, red wine, soda, and fruit juice are commonly cited for causing teeth stains, but there’s more to staining than any of these. Aging is another big factor. But unlike other common causes of staining, aging isn’t something that can be avoided. Still, with a cosmetic dentistry service like teeth whitening, there’s a way around this type of staining, one that will improve confidence. But that’s not all. With your whiter, brighter smile, you can also turn back the clock on your appearance, enjoying wonderful anti-aging benefits. At Robison Dental Group, your Canton cosmetic dentists—Dr. John R. Robison and Dr. J.D. Robison—offer two teeth whitening options for patients to take advantage of. The first option, in-office whitening, takes just a single appointment to complete and allows you to sit back and relax in our comfortable office. The second option, take-home whitening, lets you do it all on your own schedule, while you’re cleaning the house, watching TV, reading, or any number of other things. 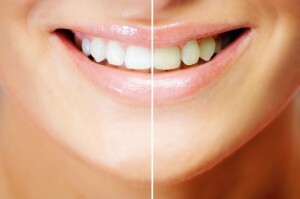 But which of these teeth whitening options is right for you? If you’d like to learn more about teeth whitening in general, or you’d like to see which option might be best for you, call Robison Dental Group today. We’re happy to offer cosmetic care to patients from Canton, Ann Arbor, Northville, Westland, and Plymouth.